Lately I’ve come to see a certain parallel between the speaker crossover and an automotive powertrain: it’s that, without a gifted tuner at your disposal, there’s often no way to exploit the true performance of the product you have in your hands. In Part I of this series we discussed the transformation of my Radian 5215B drivers, that resulted from yanking the stock Radian crossover module and replacing it with Frank Fazzalari’s Mundorf-based (M-Cap) replacement. Please refer back to that article for background. We can now refer to that one as the Level 1 Mod. And as much as it was a “day and night” change, and a very substantial improvement, I think we can now pretty much relegate it to the dustbin. It’s not that I wouldn’t recommend the Level 1 Mod – it was amazing – but now, I’d never go back. Read on. 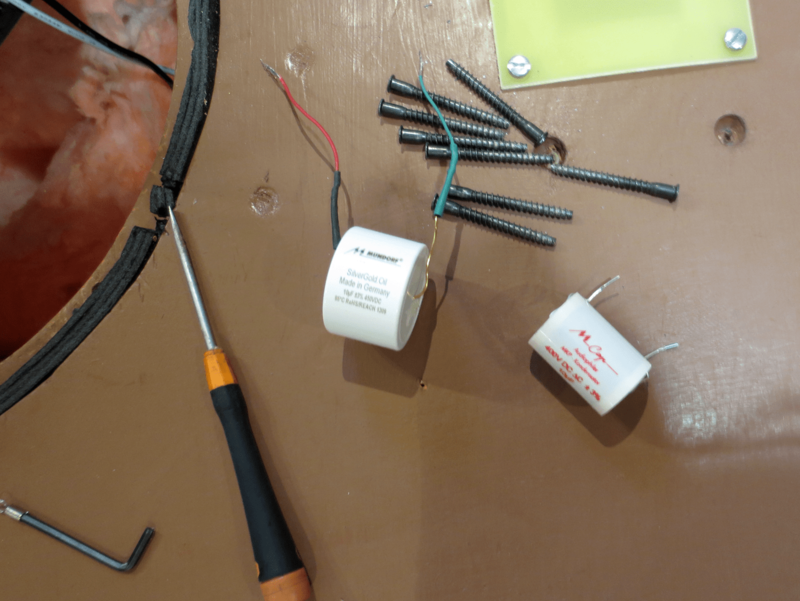 At left, Mundorf’s EVO Silver/Gold/Oil capacitor. About a month after I’d had the first mod in place, Frank came back – this time to replace the Mundorf M-Cap (Audiophile MKP), with the Mundorf M-Cap “EVO” Silver/Gold/Oil. This was a fairly straightforward swap – Frank’s module is designed to be “modular”, i.e. the capacitor leads are screwed in, not soldered. 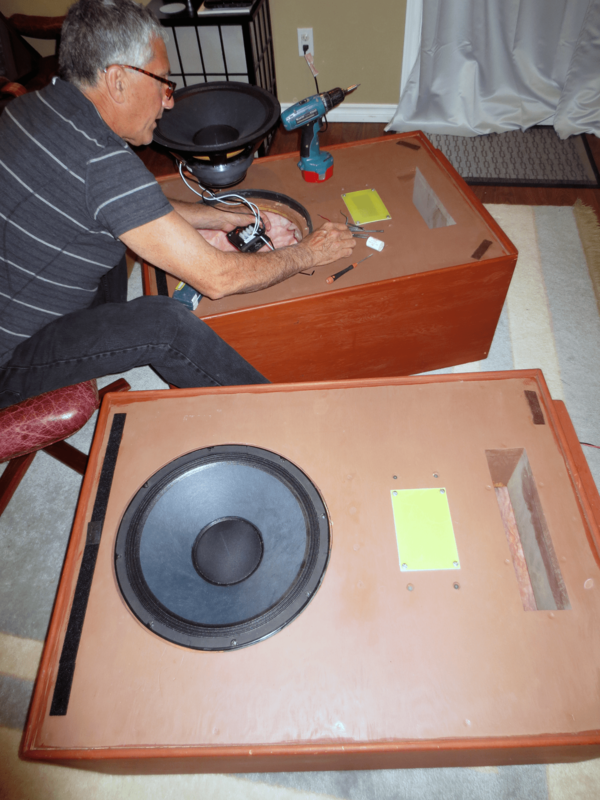 This makes changing caps a breeze: for Frank, it was less than 10 minutes per speaker, the hardest part being removing and reinstalling the massive Radian driver without damaging its frame, or the cabinet gasket. Well, what can I say? Frank has played with these mods for a long time, and seems to have this pretty much nailed. I’m just as floored by the Level II Mod as I was by the first one! Transparency is much, much better, and the bass is again cleaned up even further, so that it sounds tighter, and goes deeper. Soundstaging is noticeably improved as well. As with the Level I, these are not subtle differences. You don’t need a panel of judges, or an AB/X – the changes are clearly audible. In fact, I’d wager that in a blind test, the vast majority of listeners would say we were listening to two different speakers. Frank Fazzalari installing the “Level 2 Mod” in my Radian-based system. Since I first heard Frank’s amazing Coherent Model 15’s a few months ago, I’ve been convinced that the Radian 5215 is a high-end driver. Mine aren’t the fancy BeNeo versions that I heard in Frank’s setup, but I’m finding even these drivers in modest DIY’ed Tannoy Stuart cabs to be very persuasive – especially now with the second-level upgrade. They play with depth, richness, and pretty decent speed. Soundstaging is impressive, considering my cabinets. They’re about as sensitive as most people would want (97-98dB, now unencumbered by all that coil induction). My room is barely big enough, but the speakers really sound pretty fabulous now. I’m thrilled. Over the same time that the Level II Mod was breaking in, I was also reviewing Devine Audio’s Sound Stage III, an outstanding full-range, three-way speaker retailing at $6000/pair. Now, I can’t say that the Level II Mod’ded Radians were quite in the same class, but amazingly, they gave the Devines a real run for their money. It’s hard to overstate how happy this makes me. Upgrading an existing, relatively inexpensive speaker to a level far above its original capability is one thing. Doing it with minimal effort, pain, and expense, is truly remarkable. Even if you have no DIY inclinations, this is a very satisfying thing to witness. I can wholeheartedly and unequivocally recommend the upgrade to all owners of Radian coaxials. And I would strongly suggest that Tannoy dual-concentric owners consider looking into it, too. Where does it go from here? Well, for me, this may be where I top out. The 10µF Mundorf EVO caps retail for $104 USD each, and Frank considers them to be the ‘sweet spot’ in the Mundorf line (for this application). The “next step up” is the Mundorf Supreme (Silver/Gold/Oil), but the price jumps to around $300 per cap, and we may be hitting up hard against the law of diminishing returns, at least in my setup. In a system where all the components (including all the cables) are of top-notch, unforgiving resolution, and where money obviously isn’t an issue, that’s likely another story. In my system, well, it seems to me that Radian’s Neodynium and/or Beryllium driver upgrades would be a more logical upgrade from the current Level II cap upgrade. The new-for-2015 MCap Supreme is the latest generation top of the line S/G/O, and may be the Ultimate Crossover Cap. But we’ll soon find out! Frank informed me on Friday that Simon at Audiyo has given him some and wanted to get an “in the field” evaluation. Yippee! For now: the Mundorf EVO cap is VERY highly recommended, and deserving of our Gold Star Award for excellent performance and value. These crossovers are currently available only through Radian Audio, or directly from Frank.